Hello everyone. My name is Colin Cantwell. I conceptualized and modeled the ships for the first Star Wars film. At the behest of fans, I am letting these four decade old photos see the light of day. Most were taken in my backyard in 1975 after kitbashing the pre-production models for the the X-Wing, TIE, Death Star, and others. Kitbashing is a method of model building that myself and a few others pioneered in the early 70’s. Essentially, you take pieces from cannibalized model kits (cars, planes, trains, etc…) as well as shapes from around the office and house. Look closely and you will see pill bottle engines and Easter egg fuel tanks. Most of these ships would be used with only minor modification. The exception is the Falcon, which was scrapped at the last moment due to its similarity to the recently released “Eagle” from Space 1999. My Sand Crawler design would also be replaced by Ralph’s. All of these designs are original, although I did work closely with Ralph in the early days of the project (what a genius!). I think you’re the first person who’s actually worked on any of the films to grace our forum. The original Falcon design is so much better than the Eagle. Welcome ! I first saw your work in the book From Concept To Screen To Collectible by Steve Sansweet . Still have and treasure it and it was wonderful to see your models there as well. I especially like how your Star Destroyer really has the feel of a naval aircraft carrier .There is also a really neat concept of a landspeeder in that book . In the pictures above , the x-wing looks very sleek and reminds me a bit of a formula 1 race car . Is the Skyhopper model the same one Luke plays with in the film ? Wow! I don’t have much to say except, I’m a huge fan of your work! There was also the time Lorne Peterson cleared up some confusion. Wow, totally forgot about that! It did indeed become the Blockade Runner. 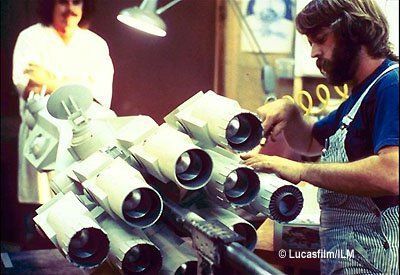 Somewhere I’ve seen an old BTS photo where the Tantive miniature was still being finished, sporting the Falcon style cockpit and deflector dish. You can’t really see the cockpit from this angle, but you can see the Falcon’s dish. Mr. Cantwell! Thanks for stopping by to chat with us! I don’t know if this would ever interest you, but I think it would be really cool to see a video of you sharing your kitbashing process, maybe you and an assistant could try to build one of the ships from your CoreFires novel that you recently published. It would be a great way to share your experience with future model makers, and also promote your book. Adam Savage, who did some model work for the prequels, has done kitbashing videos a number of times on his YouTube channel that provide a good example of the process. I think people would love to see something like this! Also guys, Mr. Cantwell has a pretty solid Instagram if any of you are on there. Thanks for your contributions in inspiring the imagination of children (and adults) for the past 40 years! It wouldn’t be the same without your creativity. I am remiss in that I forgot to say thank you for sharing these earlier . The link you provided was not working for me earlier but now that I have tried it again , I can see that the skyhopper model was indeed the one Luke played with at the beginning of the film. 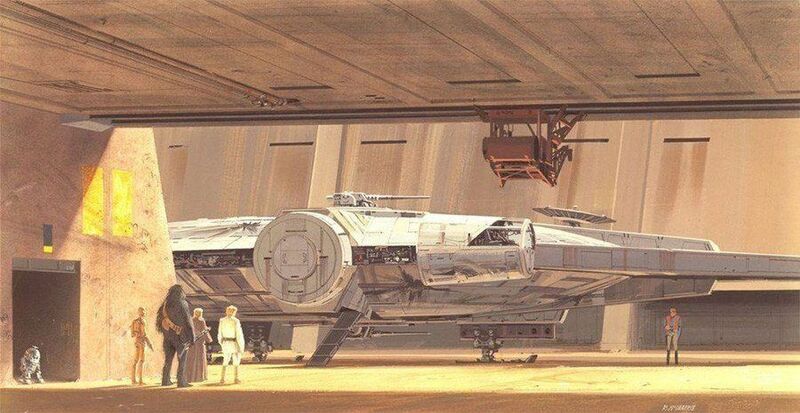 I also love that Ralph Mcquarrie used your Y-Wing in his production paintings and now we know the source of the acronym for the Tie Fighter ( twin ion engine ).It is amazing to me that we can still learn new things about the original film over 40 years later. Thank you sir , you are an inspiration ! Very cool images! Thank you for posting these, and for influencing the movies we love so much! Possibly worth noting, given the nature of his website and the way he’s only posting little, skewed thumbnails, that this is essentially an advertisement. It is an honour to “meet” one of the original design artists, you have my eternal gratitude for the work you have done that has helped to bring so many people together. Thank you. Probably is but I’m cool with that. I’ve never got a look at these early models. To see pictures of them in 1975 is awesome. 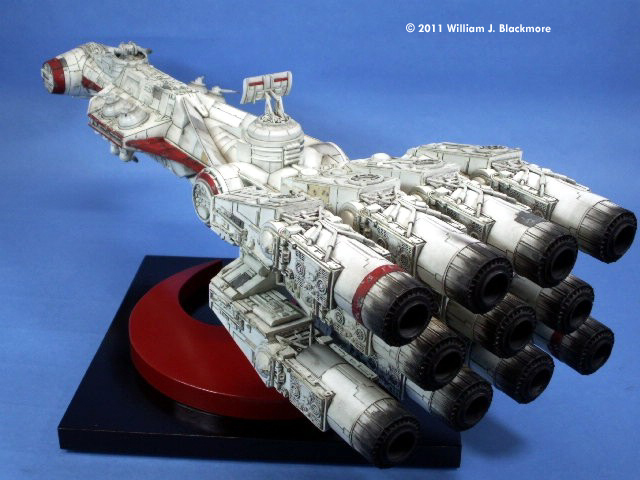 The early falcon model amazes me because of how iconic the ship today. It’s a cool design. 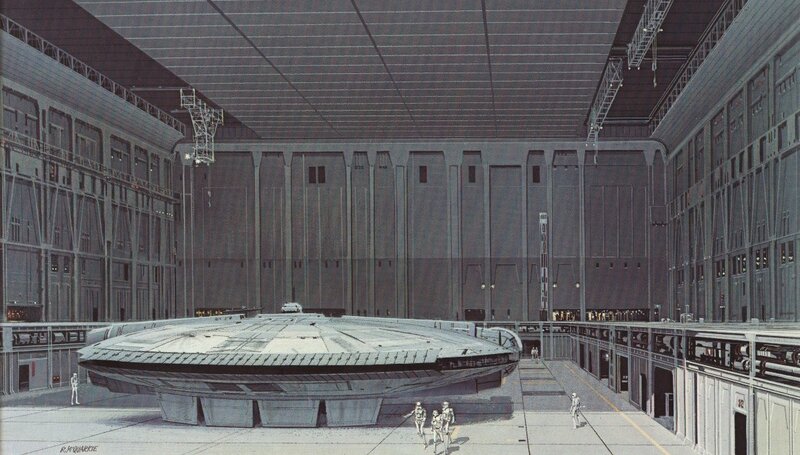 What I find interesting is there are versions of the Ralph McQuarrie paintings featuring what eventually became the Tantive, but the portfolio released after the film only features the Falcon we know. Was Lucas quietly revising the history of the film even then? 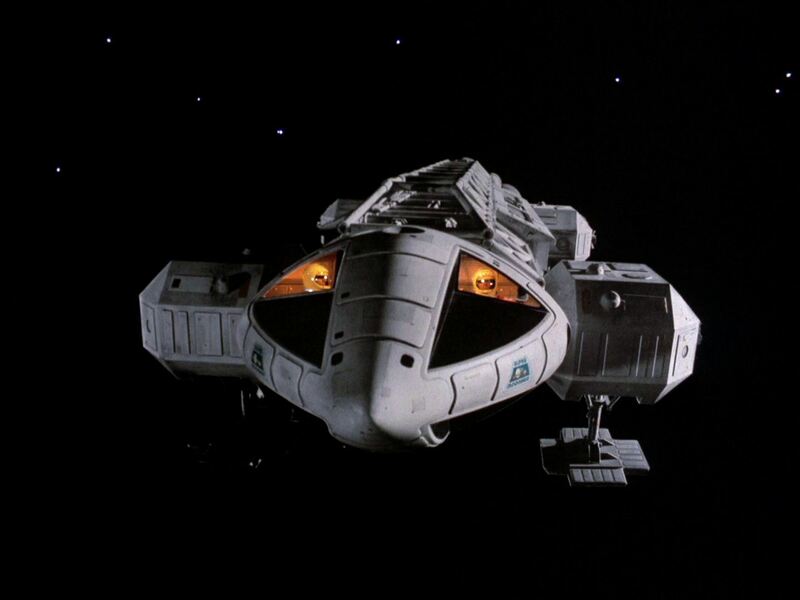 Hindsight being 20/20, I think they worried too much about a resemblance to Space 1999’s Eagle transporter, as that is at least a kissing cousin of the Moonbus in 2001. If I’m not mistaken, he was having McQuarrie redo the paintings so they could all see how the shots would look with the new Falcon design. 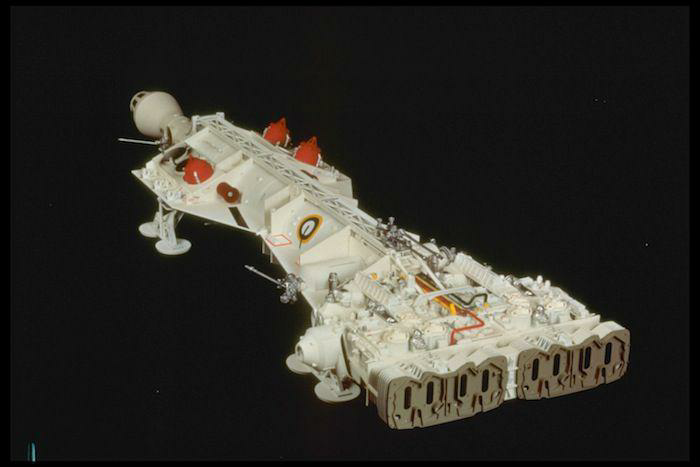 That Blockade Runner looks a wee bit like Red Dwarf.